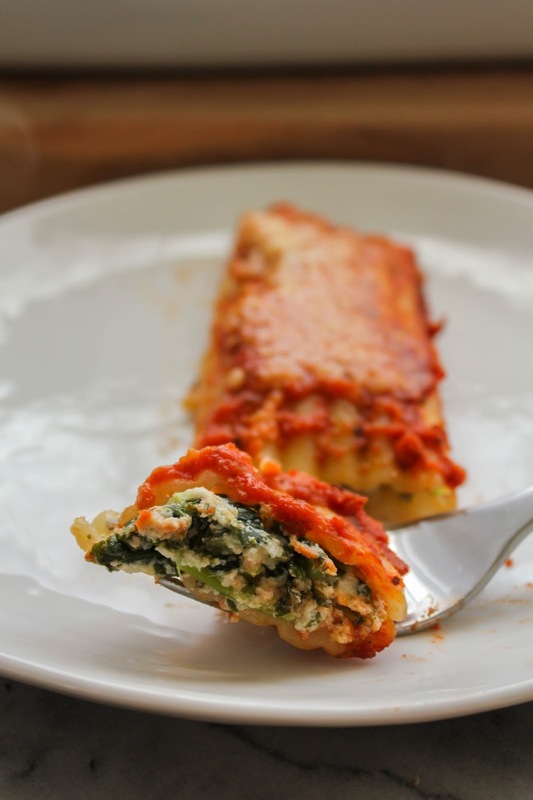 Whip up this meatless manicotti filled with cheese and kale for a delicious and healthy vegetarian meal! With the weather cooling down lately, I've been all about making comfort food! Whether it's a pot of chili or soup, or a warm casserole, Fall is the best time to start making your favorite comfort food dishes. I'm a big fan of Italian food, and stuffed shells and manicotti are right up at the top of my favorites. Instead of going with the traditional meat filling, I decided to go all cheesy and veggie with it. Because cheese. Cheese is life. 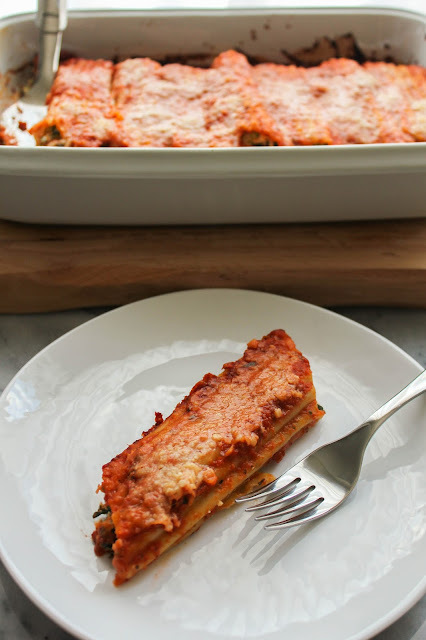 My mom made manicotti with spinach when I was growing up, which I've seen most often, but I wanted to be different. I wanted to think outside the box! When I came across frozen kale in the freezer section of my local grocery store recently, I knew it would make the perfect filling for my manicotti. I do love me some kale! 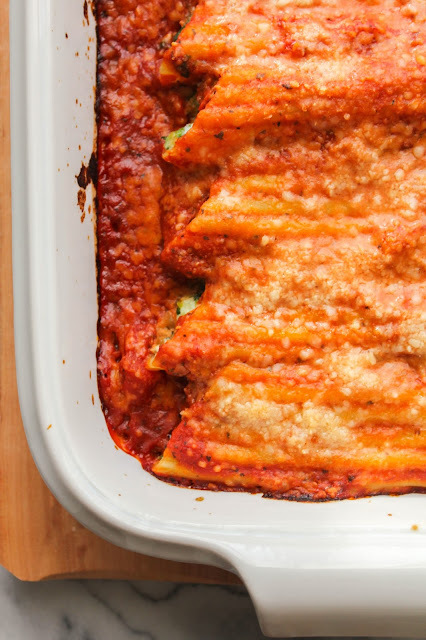 Using both ricotta and Parmesan, this manicotti is definitely filled with cheesy goodness. And honestly, kale is the perfect partner! Be sure to add salt and pepper to the filling and taste for the right seasoning level. Add as much or as little red pepper flakes as your family likes. We enjoy spice, so a couple of dashes was the perfect amount for us. Are you ready to bake up some Cheese and Kale Manicotti for your next meatless meal? Preheat the oven to 375 degrees. Spread the olive oil on a large rimmed baking sheet and set aside. In a large pot of boiling water, cook the manicotti shells according to package instructions. Drain well, then arrange in a single layer on the prepared baking sheet. In a large bowl, combine the ricotta, 1/2 cup of the Parmesan, and the kale. Mix well to combine and season the filling to taste with the red pepper flakes, salt and pepper. Using a teaspoon, carefully fill the ends of the each pasta shell. Pour about 3/4 cup of the marinara into a 9 x 13-inch baking pan. Please the filled manicotti on top of the marinara. Pour the remaining sauce evenly over the manicotti, then top with the remaining 1/2 cup of Parmesan. Bake until the sauce is bubbling and the Parmesan is browned in spots, about 30 minutes. Let stand 5 minutes before serving.